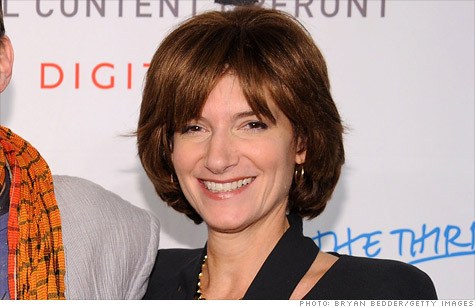 Laura Lang, currently the CEO of ad firm Digitas, will become CEO of Time Inc. in January. NEW YORK (CNNMoney) -- Time Warner said Wednesday it has hired Digitas CEO Laura Lang to lead its Time Inc. magazine publishing division. Lang will officially join the company in January, the company said. "Laura's leadership experience, brand management expertise, understanding of digital and marketing, and strong relationships with the creative and advertising communities are a great fit for Time Inc.," Time Warner CEO Jeff Bewkes said in a statement. Lang has run Digitas, one of the world's largest advertising firms, since 2008. She led the firm through its two best years of business growth in history, according to her bio on the company's website. She's coming on board at Time Inc. at a time when advertising revenue could really use a lift. While Time Warner posted a jump in revenue and profit in the latest quarter, Time Inc. had another difficult few months. The division's profit fell 12% to $124 million, as publishing suffered declines in both subscription and advertising revenue. "She is the right person to lead the company as it aggressively evolves its businesses during a time of great change and opportunity in publishing," said Bewkes. As the company struggles to boost revenue, it has also been a rocky couple of years for Time Inc. management. And Lang fills a gap Time Inc. has left open since early this year. Jack Griffin, the former CEO and chairman of Time Inc., was ousted from his position at the magazine publisher in February -- after less than six months on the job. In an e-mail to employees, Bewkes said Griffin's "leadership style and approach did not mesh with Time Inc. and Time Warner." Time Warner (TWX, Fortune 500) is the parent company of CNNMoney. Griffin had been hired to replace the previous chairman, Ann Moore, who unexpectedly retired after 32 years of working at Time Inc.
As the company looked for a replacement for Griffin, an interim management committee had been running Time Inc. That team was composed of executive vice presidents Howard Averill and Maurice Edelson, along with editor-in-chief John Huey, who all reported directly to Bewkes. Time Inc., the world's largest magazine company by circulation, publishes about 115 magazines worldwide including Time and Sports Illustrated, and accounts for almost a quarter of total advertising revenue of U.S. consumer magazines.